This week Google has made bold moves to extend its reach of Internet services. They’ve announced their intentions in the territories of ISPs, social networking, SEO consulting, and Google is now going after community-based question and answer. Google is a threatening competitor in any market, bringing with it deep pockets and an impressive brain trust. 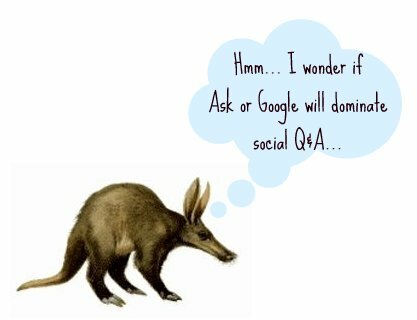 So when news broke that Google has acquired Aardvark, a question and answer–based social network, it was clear that the big dog was going after Ask.com’s neighborhood. So what do you do when Google’s coming after you? Doug Leeds, President of Ask.com-U.S., was able to give me a few minutes of his time to answer that very question. Me: Does Google’s entrance into the Q&A space affect Ask’s strategy at all? Doug Leeds: Bring it on. I don’t think it’s going to change anything really in the short-term. And Aardvark is very nascent; they have a very small user base. I don’t believe that they can scale quickly. Ask gets a million questions a day, and there’s no way Aardvark could handle that kind of volume without seriously changing their technology. We think that people want this now. They don’t want to wait for a year, two years, to get their questions answered. Whether that means questions answered from Web pages that are already published and have the answers on them, or the answers that haven’t been published anywhere and therefore you have to index knowledge that people have in their head as opposed to what they published, and extract that knowledge out through routing questions to a real-time person — which is what Aardvark is doing and is exactly what we’re going to be launching in the spring — we’ve been working hard on it here. This is what users see today and we believe we’re perfectly positioned. We’ve got the brand, we’ve got the legacy, we’ve got the percentage of traffic many, many times higher than the number of questions that Google does or anyone else in search. So this doesn’t change our strategy at all. It just makes us redouble our effort and focus more and it kind of tells us and anybody else that says, “Is this the right strategy?” that absolutely it’s the right strategy. At least to the extent that Google believes it is, too. Speaking to the need for social Q&A is today’s announcement on the Norwegian Inside AdWords blog that site clinics will be offered. In this case one can use a translation tool to find out what’s being said in the post. But that’s not always the case, and there’s nothing as reliable as a person who knows their stuff. So when the BCI writers wondered what was really written in the post, Susan sent out a quick tweet: “Anyone know Norwegian?” Her friend knew a friend who was happy to volunteer her time to translate the post. And know what? The human-translated version is more readable than the auto-translated version, and I’m guessing, more in keeping with the Google blogs usually familiar tone. Yes, humans are still good for something. That Ask and now Google are using technology to tap into the human resource is a development full of exciting potential. Ask has the impassioned head start, Google has the muscle, and users are the winners in the world of Q&A. Can Yahoo Overtake Google in the Ad Battle?